The starting point of the walk, Flüeli-Ranft is a small village where Brother Nicolas, the patron saint of Switzerland lived. He was also known as Brother Klaus and lived in the 15th century. The walk started from the chapel built in his honour. The gathering joined in the chanting of a beautiful prayer by Mrs. Annette Kaiser, the head of Villa Unspunnen. The walk began to the wonderful sound of pealingchurch bells.Sri M led the walk through an ancient pilgrim path. 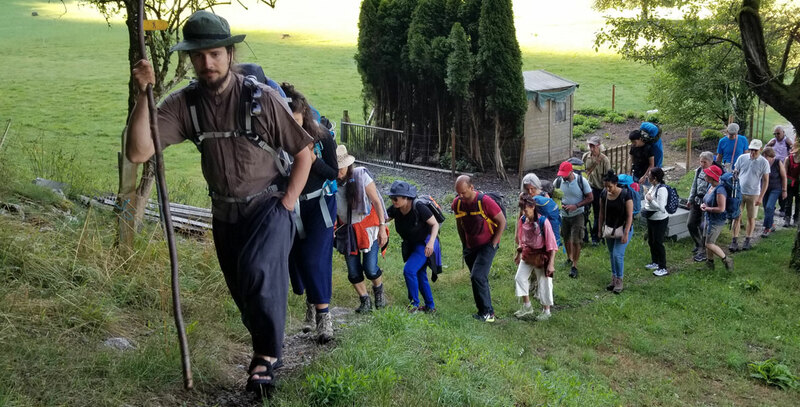 There were stops on the way as the walkers visited the cottage where Brother Nicolas lived with his family and also his lodge where he lived alone immersed in his spiritual practices; a place with much beauty and peace, surrounded by meadows with a river flowing nearby. The group covered a distance of close to 10 km in perfect weather, walking uphill first and then on flat terrain. 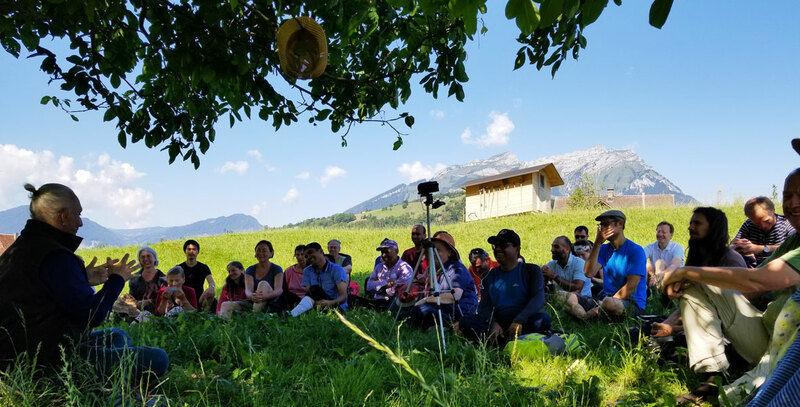 They stopped under an old oak tree where Sri M held a ‘Satsang’, the first in the Alps, an experience enjoyed by one and all. A mild shower announced the end of the walk at St.Jakob. Today, the trek was on the mountains dotted with climbs and slopes. The walk, covering a distance of 15 kms, was through breathtakingly beautiful forests. 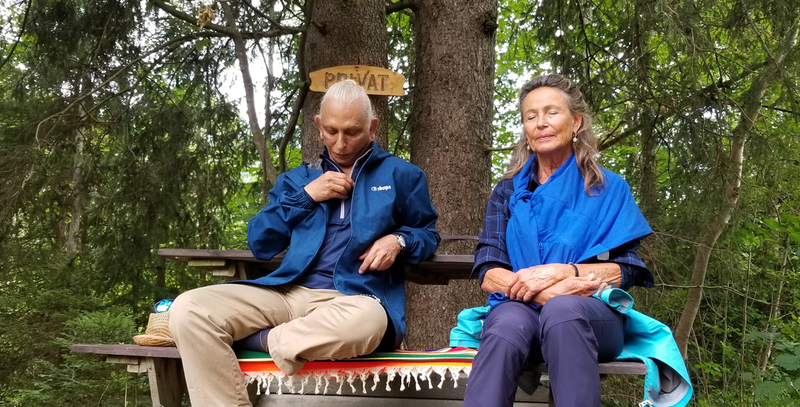 A short while through the walk, Mrs. Annette Kaiser spoke about the theme of the day – silence and respect for Mother Earth. Walking in silence, the travelers took in the scene of the majestic mountains surrounding them. The walk was challenging for they had to watch every step as it involved either a climb up or a step-down, and heaving a sigh of relief when they finally came upon a flat patch. The Satsang with Sri M was under a walnut tree, a talk replete with humour and anecdotes. 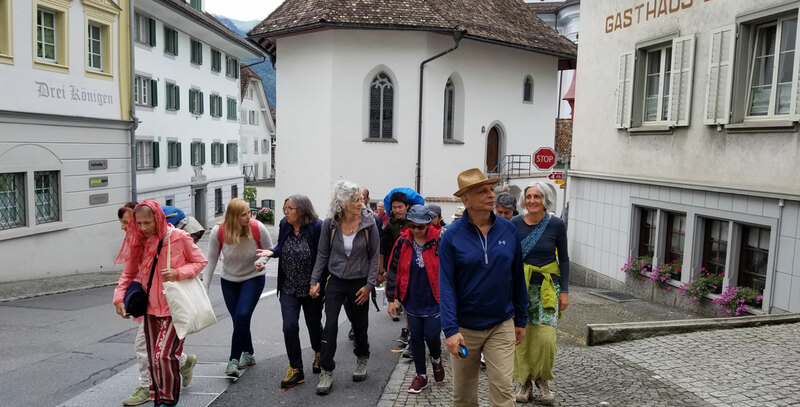 Then followed the second half of the climb which ended at the church in Buochs with a song sung together by the group. The sun shone bright, bringing back memories of ‘The Walk of Hope’ heldin India for some of them. 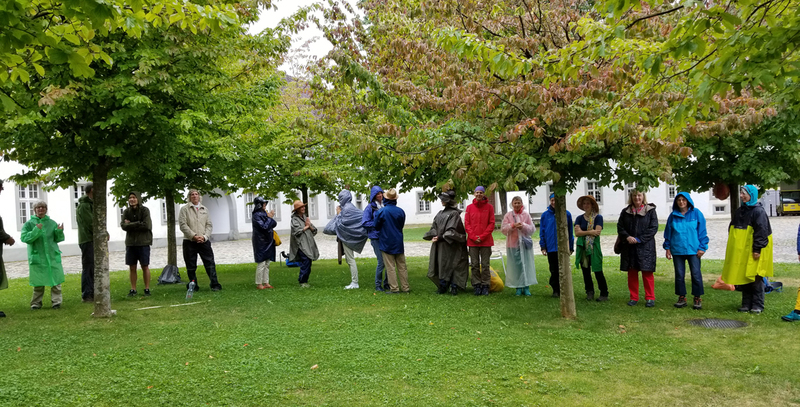 Starting at 9.00 a.m. from Buochs, Annette Kaiser set the theme for the day: To be compassionate and kind, to walk together, and see everyone through our hearts. It was indeed an apt theme as the climb was the toughest they had experienced. An hour into the walk, the group rested under a tree for Sri M’s Satsang. An interactive session was followed by a short meditation session. Then the group slowly began the uphill journey. The distance covered was 16 kilometers and the height climbed almost 540 meters. After the steep ascent, they looked down upon the shimmering turquoise lake deep, a sight to behold! The closing prayer was sung in the meadows. 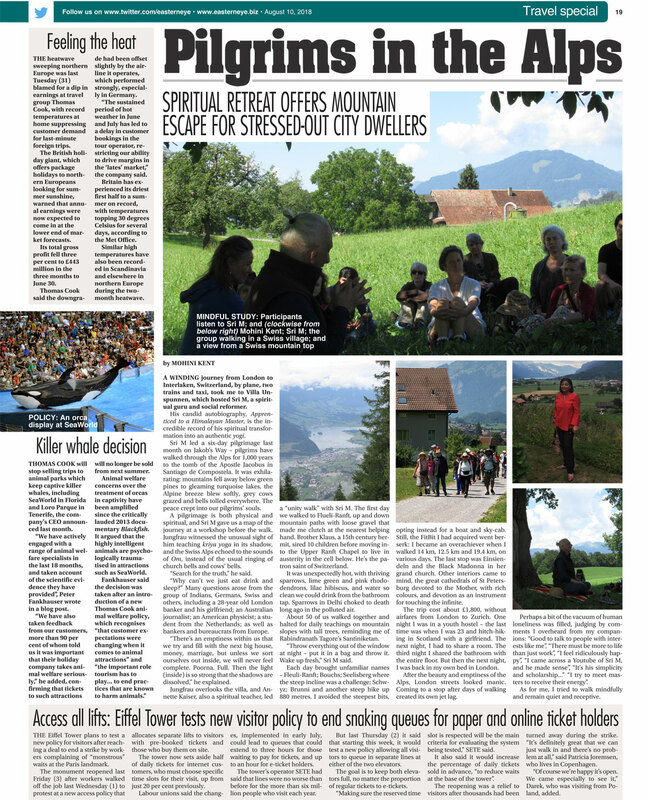 The last segment was covered by a mountain train ride from Trieb to Seelisberg – a respite everyone enjoyed after the tough walk. Seelisberg was their place of stay for the night. Today’s theme was the spirit of unity. The walk to Trieb was through the picturesque forest going down to the lake. 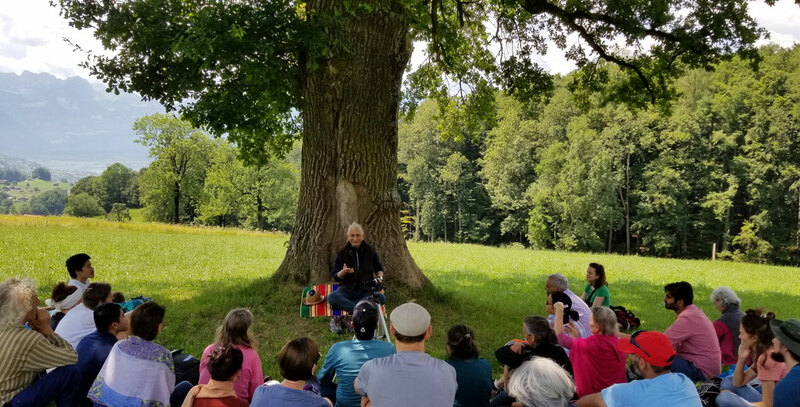 The group sat on the path while Annette spoke to them about the historical importance of the place called Rütli Meadow, the birthplace of Switzerland. 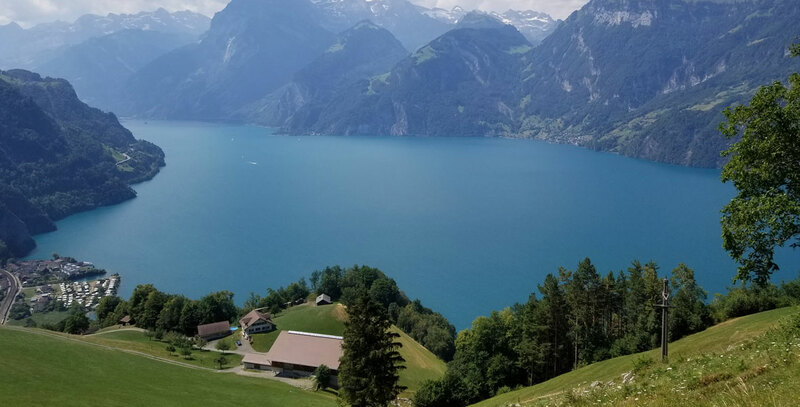 On August 1, 1291, the oath for Swiss Confederation by three original cantons of Uri, Schwyz, and Nidwalden was taken here.The spirit of unity was upheld, preserved and protected which helped in building the nation of Switzerland. On August 1st every year, the Swiss National Day is celebrated. The walkers approximately 50 in number, led by Sri M, sat in contemplation here for a while and then proceeded towards Trieb to catch the boat to the other side of Lake Lucerne. Boarding a large boat, they crossed over to Sisikon. They climbed up 750 meters through beautiful, green meadows. 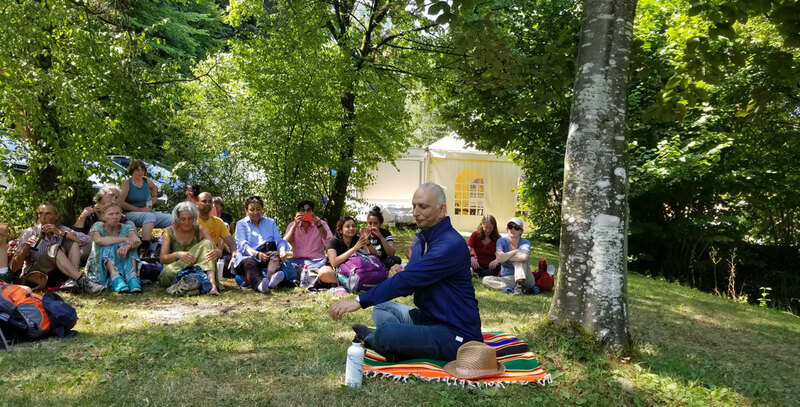 Sri M’s Satsang was held at Schwyz. 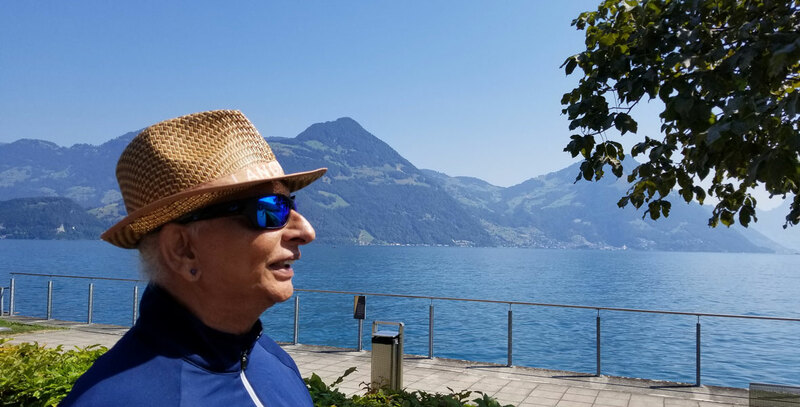 It was indeed a stunning view overlooking the shimmering waters of the turquoise Lucerne.The topic was meditation and dealing with the chattering mind. The walk concluded for the day at the bus station with a light shower and a cool breeze signaling another day of walking in unity. 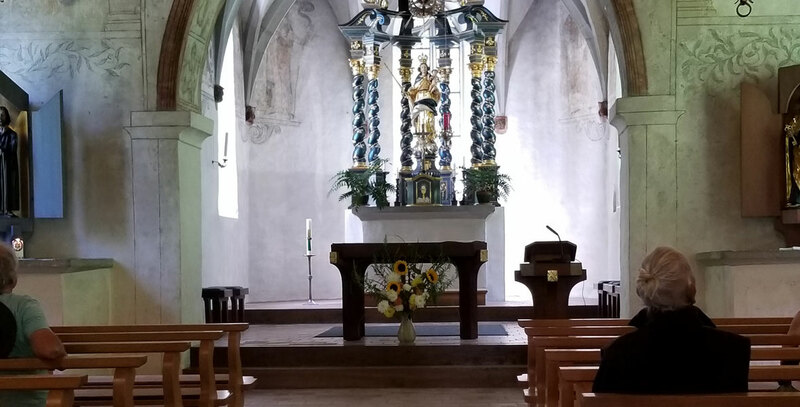 The walk started off at the church in Schwyz. Annette set the theme of the day, and they sat in silence for a while. The silence continued during the first half of the walk. The mountains were steep and rocky. 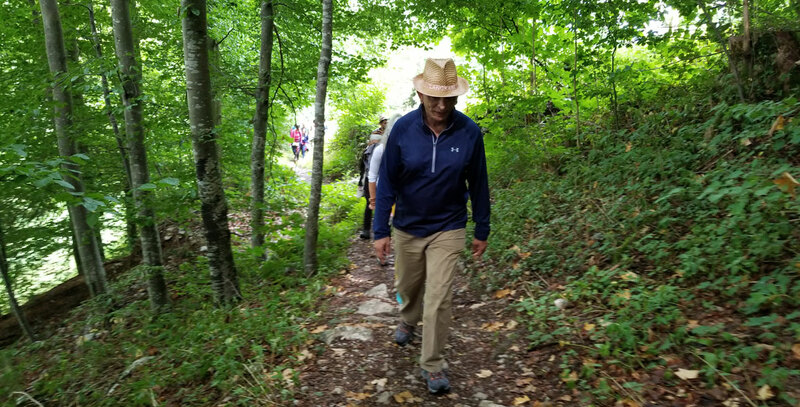 They walked through forest trails and hiking paths. 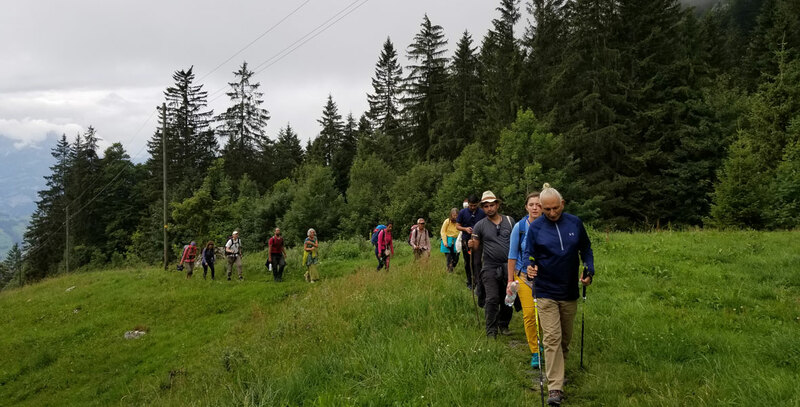 It was a tough climb, and the walkers progressed slowly and steadily with a few halts, rejuvenating their energy with fresh raspberries which grew in plenty on the way. After a climb of 4.5 hours, the group was welcomed by two people playing the alphorn, one of them 93 years old. The rich and deep sound reverberated in the hills for a long time and had a soothing effect. The group enjoyed the music and were also given an opportunity to blow the horn. Lunch followed at the restaurant at Holzegg. The view was ethereal with clouds hanging low on the majestic mountains. Sri M’s Satsang was organised at the chapel in Holzegg. After a break, the walkers started their descent on the other side to their destination for the day, the small village of AlpthalBrunni where they spent the night. A fitting finale it was, the last day of the walk over a flat terrain amidst pleasant weather. The walking trail stretched mostly along the River Alp. The concluding Satsang was held at a spot surrounded by thick trees, with a wooden bench in the midst. 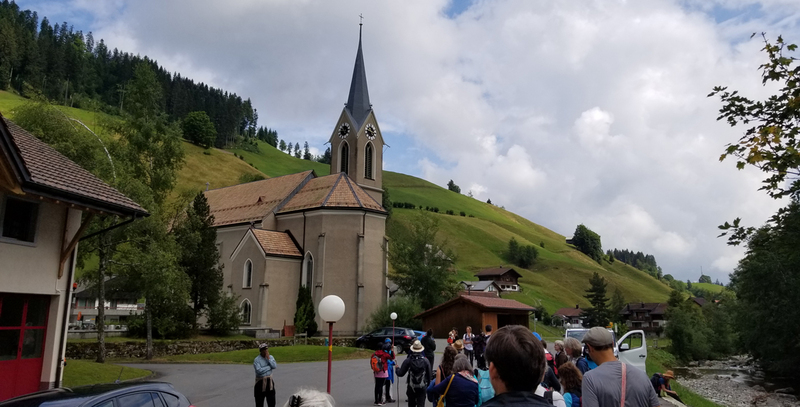 On reaching Einsiedeln, the group gathered and acknowledged the culmination of the walk. Later, in the evening, all of them visited the exquisitely beautiful Monastery of the Black Madonna. The grand baroque architecture was awe-inspiring. The group witnessed the evening service as the monks sang and organs accompanied with their enthralling music. The atmosphere was hypnotic and the experience moving. The statue of the Black Madonna, set in the golden backdrop, was beatific to behold. The walkers converged for the final dinner in a light and joyful atmosphere. 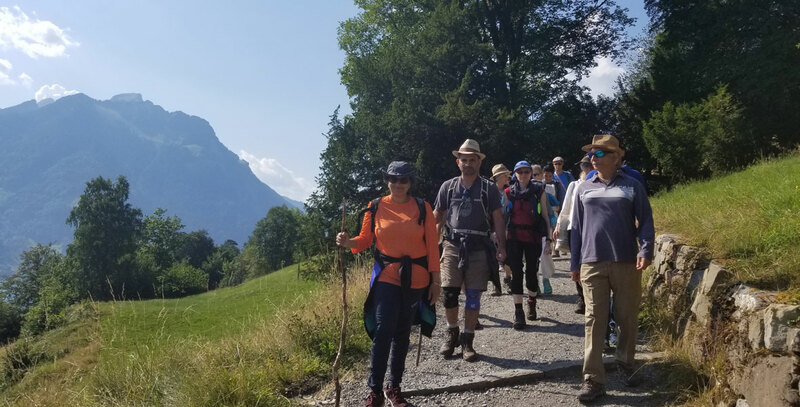 There were plenty of smiles around as they had completed the walk successfully, having covered more than 80 kilometres in the stunning Alps.